Alex- i stumbled across your website and almost vomitted on myself. The facts always seem to hurt the secular progressive movement! That certainly would be one helluva gotcha, if only I had said (or even implied) that the military targeted unintelligent, or uneducated people. If fact, I said that they targeted lesser privliged citizens - often by offering the high school graduates you speak of a way to afford advanced education (which is a good thing). 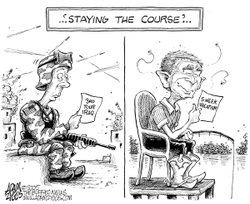 In reality, neither I nor John Kerry said anything about people in the military being stupid. However, since the actual argument (in my case) or statment (in Kerry's case) isn't quite inflammatory enough, people like you choose to change the plane of debate to something that better suits your interest. So let me try a similar tactic, with some similarly damning facts. In 2005, California produced more peaches than any other state with 106,500 acres of peach and nectarine production. South Carolina was second, with Georgia coming in third. So, before you run your mouth about Georgia being "The Peach State", perhaps you should check your facts! Please feel free to read my book to further your own education.